News from the world of sailing. An update on the technology behind the next America’s Cup. 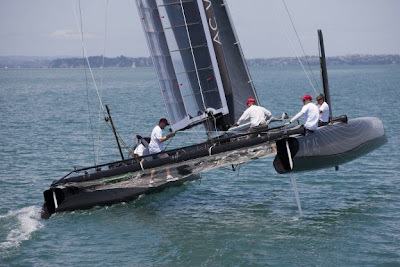 The first AC 45 was launched and test sailed in Auckland, New Zealand last week. This is the one design boat that America's Cup teams will be purchasing and taking on a world tour with stops projected to be in Asia, both coasts of the United States, New Zealand and Europe. This world tour is expected to start in September, 2011 in Newport, RI and continue for approximately a year (full details will be announced soon). Along the way, we’ll be treated to fleet racing (multiple boats) on short courses up close to the spectators (similar to the Extreme 40 Series). The new class of boat was designed with input by none other than Pete Melvin and his team; they are the lead designers for the Gunboat series of boats, the Nacra F-20 Carbon and the Nacra F-18 Infusion and many other performance and work boats. The teams will use the AC45s during tour to get used to sailing high performance boats with wing sails in close quarters. The class is unique in that one of the design criteria was for a boat that could be dissembled easily and fit into a couple of 40 foot shipping containers. This was done to make it easy to transport the boats between venues by standard inter-modal transportation (cargo ship, rail, truck, plane). This will also allow a wider variety of venues to be utilized as no special infrastructure will be required to handle the boats. Remember these quotes are coming from the man who had the honor of driving the boat carrying the largest wing ever constructed (bigger than an A380 airliner's wing); this was of course BMW Oracle's USA 17 - a 90 foot by 90 foot trimaran used to win the 2010 America's Cup. On its second day out the AC45 hit over 25 knots in 25 knots of breeze. The sailing team plans to keep testing the boat while the build team produces the 8-12 boats and spare parts needed for the world tour. Stay tuned to the Daily Boater for more news on this exciting class of boats.